Coop has been named this year's most sustainable retail chain at the 2016 Swedish Retail Awards. The win has been attributed to Coop's new store formats with a focus on sustainability, along with their "wonky" vegetable campaign. The Retail Awards are organised by the Swedish Trade Organization together with the trade magazine Dagens Handel. "We have always seen ourselves as a green company, however, we have been very busy this year refurbishing the formats in all of our stores and communicating to the customers about how they can shop organic, fairtrade and more environmentally friendly. We launched a film called 'An organic effect' which shows the effect on one family once they switched to organic foods and this was a huge success and seen by approximately 50 million viewers around the world." shared Louise König, Sustainability Manager for The Co-operative Group. A campaign called "it is the inside which counts", promoting the sale of wonky vegetables, was also launched this past year. It encourages consumers to purchase these vegetables and help eliminate food waste. Louise shared that she would like to get to the point where farmers can contact them when they have a bad season and their produce is crooked or 'wonky' so the retailer can buy it from them directly instead of being sent off as animal feed. "We have a special place in the store where we sell them and there are also special plastic bags for the wonky fruits which gives the customer tips and ideas about what they can do in their home to reduce food waste." said Louise. Another change this year was more simplified and greener store formats. The interior of the stores now have warmer colours and feature more of the colourgreen, which is Coop's corporate colour. There is a larger focus on fresh fruit and veg when customers enter the store, as the retailer is trying to foster healthier options for their customers. There is a larger focus on merchandising to combine food inspiration along with sustainability. Stores have a sustainable shopping tour which customers can follow to learn more. Outside the store there are now places where people can pump their bicycle tyres or tie up their dog while they go shopping. "I think that it is both of these campaigns which led us to receive this award last Monday. We have really been focussing on projects on how to become more sustainable. Coop wants to combine food health and sustainability, to support consumers to make better choices." said Louise. It is the second time this year as Coop's sustainability efforts are praised. 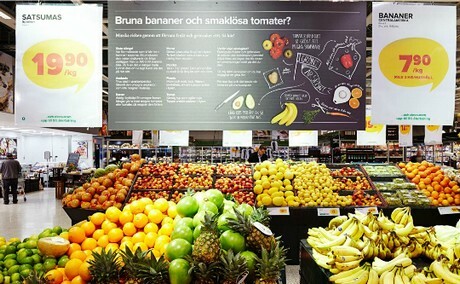 Earlier this year appointed the Swedish people Coop retailers' most sustainable food chain in Sustainable Brand Index.